Masterwood is a name well known throughout the wood working industry and has gained a strong following in Australia. There are many installations of Masterwood CNC all across Australia and they have proven themselves over many years. Tuckwell Machinery proudly distribute and service Masterwood in QLD which allows us to offer a complete one stop shop for any workshop. Masterwood still design and manufacture their machines in Italy which is becoming increasingly rare, this decision has allowed them to maintain their outstanding reputation for the quality and reliability of their products. 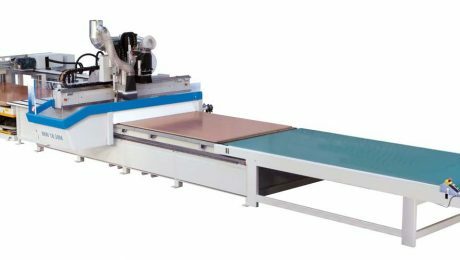 The Masterwood range is made up of Nesting machines (Stand Alone or in a Cell), 3 Axis Flat Beds or Pod & Rails, 5 Axis Flat Beds or Pod & Rails, Door & Window Lines & Through Feed Drilling Machines, Custom machines plus a range of software designed in house. For more information of these Italian made CNC machines please contact us to discuss your needs.